We serve Keene, Burlington, Colchester, Keene, Burlington, Colchester, Lebanon, South Woodstock, Claremont, Concord, Milton, Berlin, Hanover and many nearby areas in Vermont and New Hampshire. At Northern Basement Systems we have what you need to encapsulate your crawl space and upgrade its energy efficiency. Our warranteed products can keep water and moisture out of your home while making your home more energy efficient than ever! 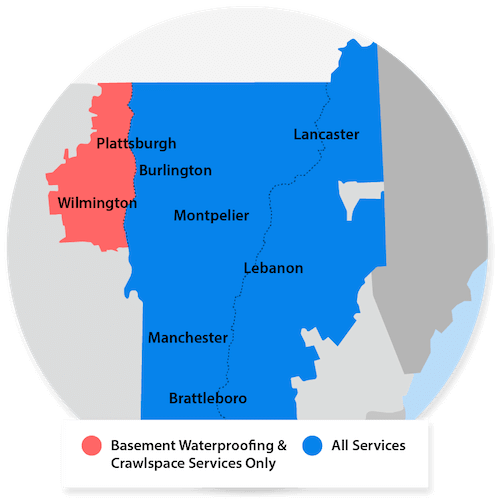 We proudly serve Burlington, Keene, Colchester, Rutland, Laconia, South Burlington, Bennington, Brattleboro, St Albans, Montpelier, South Woodstock, Lebanon, Concord, Claremont, Hanover, Milton, Berlin and many other parts of Vermont and New Hampshire.